This is a guest post by Blue Harbinger. He is not long SPG but we are. Simon Property Group (SPG) offers an attractive 4.7% yield and a compelling valuation. However, it continues to face pressure from market fearmongers and negative sector narratives. This article reviews the cloud of negativity surrounding Simon, and then considers the health of the business, valuation, risks, dividend safety, and concludes with our opinion about why Simon may be worth considering if you are a long-term income-focused investor. If you don’t know, Simon Property Group is a self-administered and self-managed real estate investment trust (aka REIT). It owns, develops and manages Class A retail real estate properties which primarily consist of regional malls, premium outlets and mills. It’s the largest mall REIT and the second largest overall REIT in the US. 1. Will Online shopping kill all brick and mortar retail? 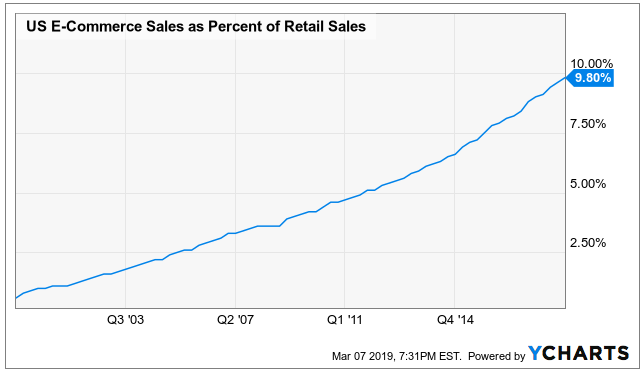 As the internet continues grab a larger share of retail shopping dollars (see chart below) investors fear that all shopping mall REITs (such as Simon) are eventually going to become obsolete. However, remember that Simon owns A Class properties, whereas CBL and Washington Prime own malls in less desirable locations. In fact, Simon spun off its less desirable properties to create Washington Prime a few years back (this should help highlight the high quality and desirable locations of SPG’s properties, which generally command higher rents and have tenants with higher sales per square foot). In reality, mall real estate will continue to evolve, and meet the experiential needs of shoppers. For example, according to this recent Wall Street Journal article, Amazon, Long Seen as a Threat to Malls, Is Now a Hot Tenant. 2. Will Rising interest rates wreak havoc on all REITS? The other false narrative is that rising interest rates will make life excruciatingly difficult for REITs because they rely heavily on borrowing to fund growth. It’s true that the cost of borrowing will increase for Simon as interest rates rise, but if rates are rising that means the economy is strengthening which generally means Simon’s business will be doing better, and they can pass the cost of rising rates directly through to their tenants. And in reality, rates likely won’t increase as fast as some fear mongering investors proclaim. For example, according to John Williams, president and chief executive officer of the Federal Reserve Bank of New York, The U.S. economy is heading into a "new normal" of slower growth that likely will keep monetary policy restrained. Besides, Simon’s business is so strong in the eyes of creditors and credit rating agencies, that the cost of borrowing is much lower for Simon than it is for the CBLs and Washington Primes of the world. Here are SPG’s credit agency ratings. Simon's access to capital, scale, and validated record position the firm to execute on any attractive and available investment opportunities. Simon's high-quality portfolio will continue to present attractive locations for tenants to place stores even as retail companies look to reduce store counts and present the most desirable locations for e-tailers looking to establish a physical presence. Simon’s mall and outlet portfolio contains a high percentage of the best malls in the country where redevelopment capital can be deployed at the most promising yields. Another thing to keep in mind is that the real estate sector has been very strong and is starting to overheat in terms of valuations, as we recently wrote in this article. However, one of the key takeaways of that article is that Simon is a bit of an exception—Simon’s valuation is significantly more attractive than many other popular REITs. We wrote this article as a follow up to dig deeper into Simon, which we believe is attractive. From a valuation standpoint, here is some perspective. Specifically, on a Price to Funds from Operations basis (“FFO”) and Adjusted FFO, Simon is inexpensive relative to its own historical standards. Yet analysts expect FFO to keep growing significantly (a good thing), as shown in the following table. Further, SPG management is providing guidance supporting the growth thesis, and the 22 Street analysts covering the firm agree and recommend an overweight. For more perspective, these analysts, on average, believe the shares are undervalued by 12%, and they are notoriously too short-term focused with these targets (i.e. Simon has significantly more long-term price appreciation potential—in addition to the big dividend). From a dividend safety perspective, Simon’s dividend is very safe. Not only has the dividend been steadily growing over the years (as shown in this chart), but SPG has a very strong credit rating (as we saw earlier) supporting the notion that they are in a strong cash flow position. And as further support of their strong cash position, the company recently announced a new $2 billion share repurchase program (a very good thing for investors, and another indication that management believes the shares are undervalued). If you are looking for a very strong, healthy, growing dividend, Simon is worth considering. Not only is the dividend attractive, but the shares are trading at an attractive price. The negative market narratives (i.e. brick and mortar retail is dying, and rising interest rates will kill all REITs) are overblown. And despite some overheating prices for many popular REITs, Simon’s share price and valuation remain compelling. This doesn’t mean the price can’t get more compelling (the shares could still decline), but if you are a long-term income-focused investor, at the very least--Simon is worth keeping on your watch list as an attractive opportunity. Disclosure: I/we have no positions in any stocks mentioned, but may initiate a long position in SPG over the next 72 hours. I wrote this article myself, and it expresses my own opinions. I am not receiving compensation for it. I have no business relationship with any company whose stock is mentioned in this article.